I have the first 13 books by Robert E. Howard ( and friends–as they carried on and expanded upon the Hyborian Age after Howard’s death) right here and I’m taking my time going through them and Stiegg Larsson;s “The Girl who….” series. If any of you like sword and sorcery tales, then CONAN is the man and series for you. Howard’s writing is pure pulp and bare bones. He’s writes from the gut and, once in a tale, there aren’t any minor plots to deviate from the story. Conan rides into town, and bloody action quickly follows. Howard has a great style about him, and I liken his prose to that of Shakespeare, once you start getting into it, you love it. Conan from the movie is a big brutish silent type but not so, in Howard’s tales, Conan is a talker, and tells it like it is. It’s exceeding refreshing. The villains are villains, the hero(es) swaggers, and from time to time, there are monsters. This is the version I have, and the artwork on the covers reflect the stories within. They are grand, sweeping, and no holds barred. 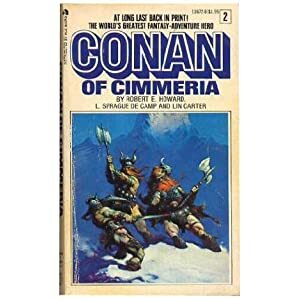 The world building is on par with Tolkien’s Middle Earth, and, only until recently, have publishers decided to expand upon the Hyborian Age by releasing new books centering on heroes other than Conan–which there obviously had to be. 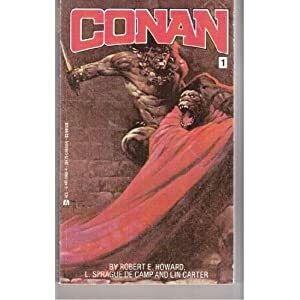 The Hyborian age was a huge, fleshed out world with different languages, cultures, and customs that one saw through the eyes of Conan in his many adventures, but there had to be others like him. I’ve yet to read any of these new books, but I’ll probably will in the future. 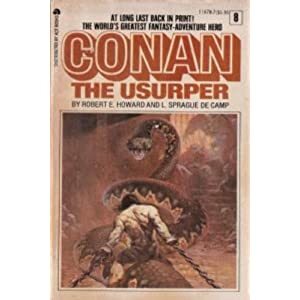 Currently, I’m reading the eighth book in the series, Conan the Usurper, and after reading the first seven books for the second time in years, I’ll probably cut through it in a day or two. You know how when you see or read something as a kid and go “Wow this is so cool!” only to later read/see it again later and wonder what the hell was so impressive about it? Not with Conan. For me, anyway, it’s better. 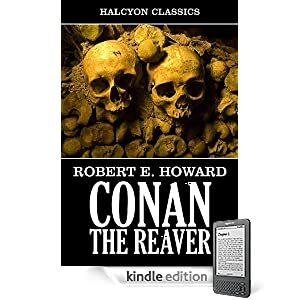 It’s a shame that Howard only wrote a handful of tales about the Hyborian Age. There are companions that Conan met, fought and drank with, who went on to become kings in their own lands (Juma comes to mind). These characters would be good enough for their own series I think. Maybe they will get the treatment one day, but, anyway, I’m happy that publishers holding the rights to the stories are developing more in that world. 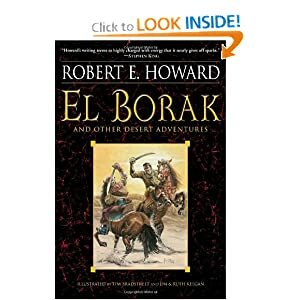 Howard did write similar characters in different worlds–Solomon Kane comes to mind, as does El Borak (which is, essentially, Conan in a desert)–but for me, CONAN is the real, undiluted stuff. Anyway, just a quick introduction to what influenced me and what I grew up reading. If you enjoy adventure, if you like barbarians living by their wits and the strength of their swordarms, if you like the odd beastie in the night, then I recommend this wonderful series of books. I love em. You can pick up most of the series on Amazon, but if you are into treasure hunts, look around the used book shops. These books are bargains and must-reads for fans of heroic fantasy. I’m doing a bit of beta-reading for a friend these days, but work on 131 Days progresses, and Cauldron Gristle has entered second draft stage. Once all of these are done, I think I’ll adjust my publishing schedule a bit. I’ll tell you later. PODIUM PUBLISHING to PRODUCE “131 DAYS” with JOHN LEE NARRATING! !